Our farmers’ markets (North York & downtown Georgetown) have been going for a couple of weeks now, and it’s great to be back. It’s always good to see familiar faces & old friends again. But I will admit that we began this market season with a lot of uncertainty & some trepidation. We knew that one of the first questions most people ask is, “How are the crops. Did the fruit trees come through the winter ok?” And then we have to tell them that we are no longer in the fruit-growing business. Reactions are usually similar – disbelief & confusion, along with disappointment (and occasionally even some anger), followed by the question “Why?” We have our standard answer, which is basically a shortened version of our blog post from last fall (https://thiessenfarms.com/2015/11/11/changes). It is not entirely a satisfactory answer for many customers and they leave our market stall unsure of what to think. But most have also assured us of their continued support & patronage, as they anticipate our vegetables & berries. For this we are grateful. This is our 2nd week of CSA. We are not getting the same questions & reactions as at the market because our CSA members already knew. Most read our blog & saw the news last fall, or saw in our 2016 CSA information that fruit would no longer be a part of the program. While many responded by not joining us again, others are giving us a chance to fill their weekly boxes with a greater selection of fresh vegetables & berries. 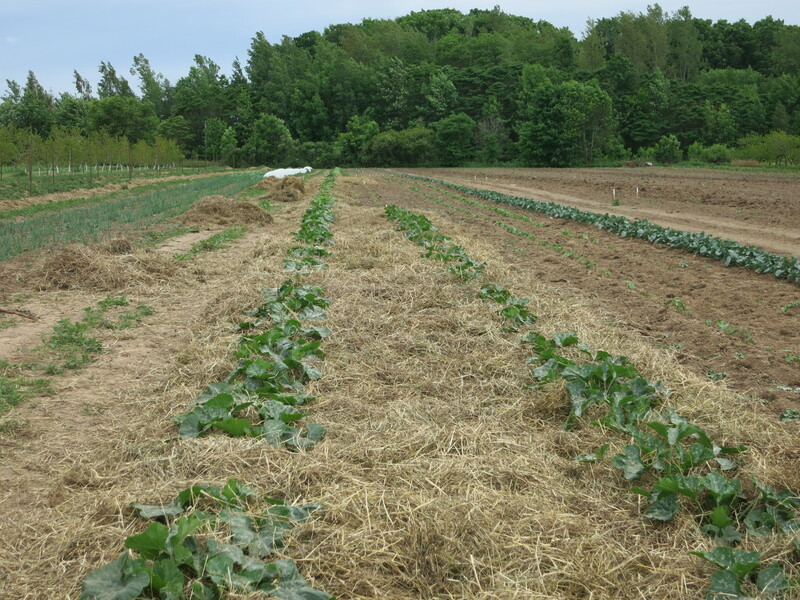 We prefer to mulch the vegetables after a rain when the ground is wet. 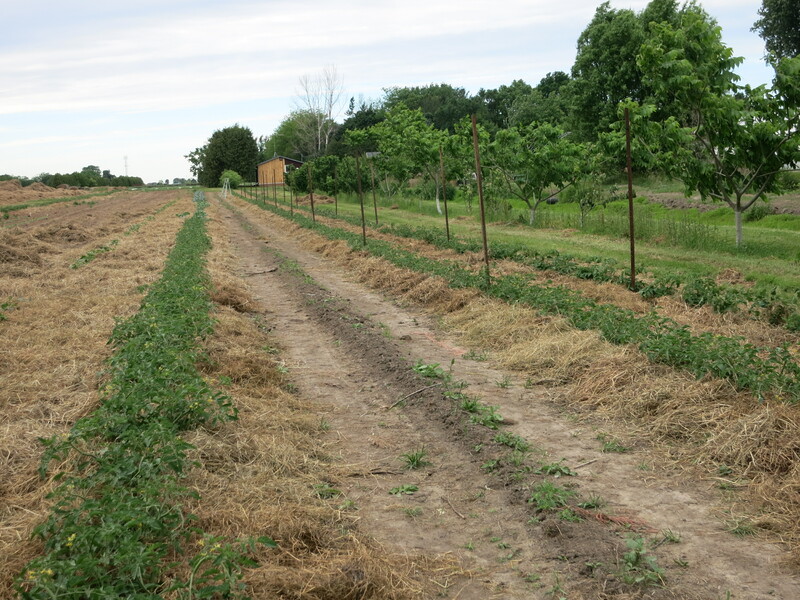 The mulch will then keep the soil from drying out & hold the moisture. 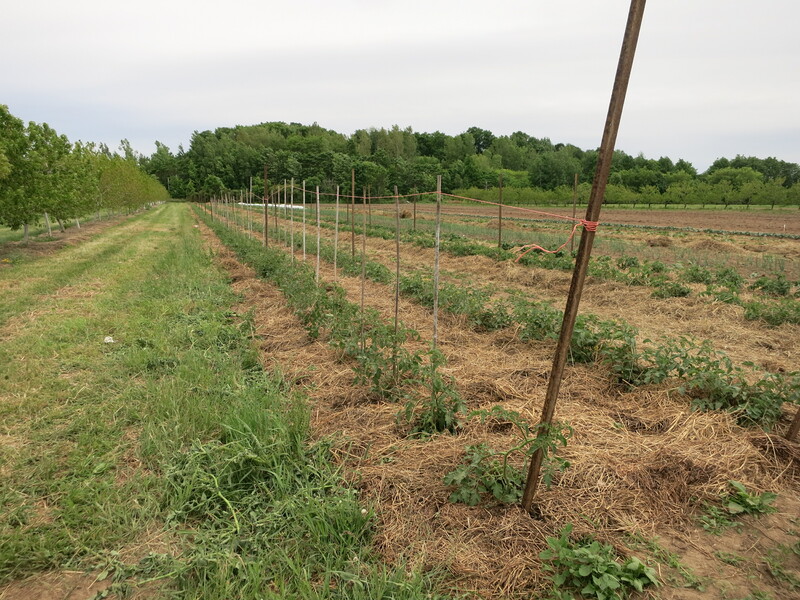 But since that isn’t going to happen this year, we mulched the tomatoes today as the plants are getting large. Then we began to stake & tie them. The zucchini also got mulched. along with the fava beans & sunflowers. Salad turnips, lettuce, spinach, radishes, Asian greens, plants. Lettuce mix (or perhaps single varieties of lettuce), spinach, radishes – it’s fresh salad time. The Asian greens are delicious to eat but frustrating to grow. While they come on quickly, which is a good thing, they also finish quickly. 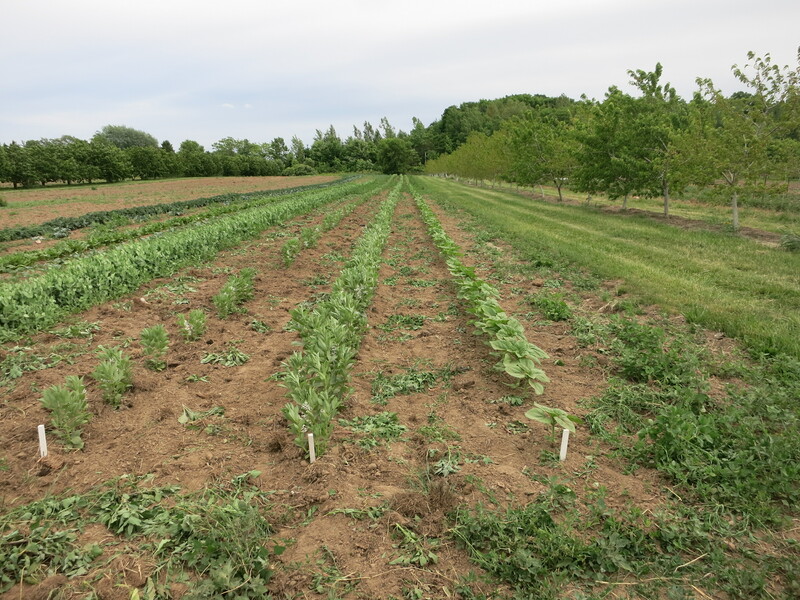 Some our plantings bolted (which means blooming & going to seed) before we could even harvest them. But they sure look beautiful in the field, and the bees & other pollinating insects love them! See the picture below. 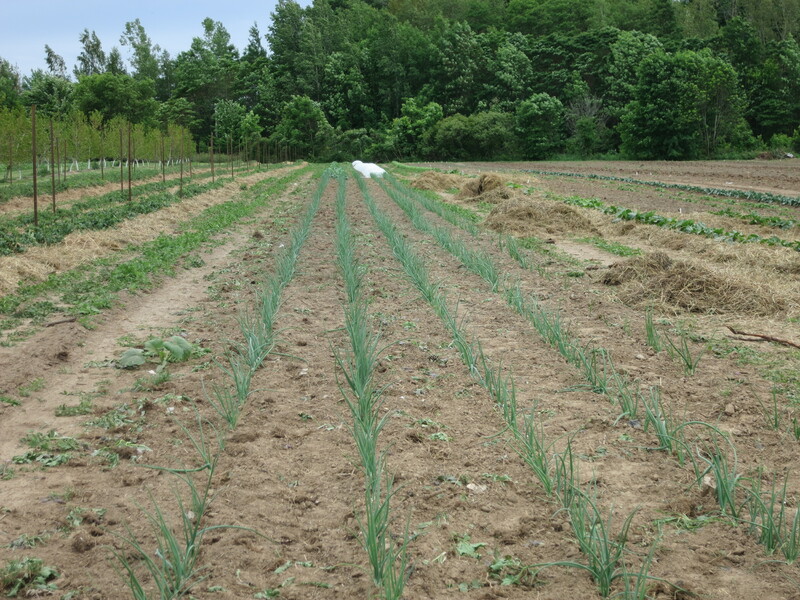 We know many of our CSA members enjoy having their own gardens too. This week choose a tomato, pepper, or eggplant plant to grow. 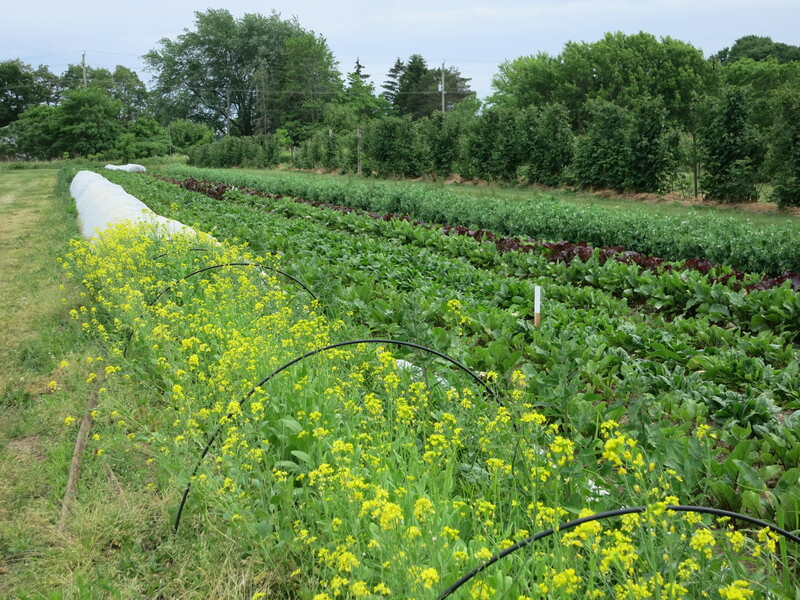 While you can expect to get plenty of all of these vegetables in your boxes this summer you may still want the pleasure & satisfaction of growing & picking some of your own produce. Thanks, Ron. Its good to catch a middle-of-June glimpse.